Aloe Body Toner, a wonderfully warming and invigorating cream, is combined with the power of stabilized Aloe Vera gel to shape and tone the skin. Formulated to be used with cellophane wrap, it contains emulsifiers, moisturizers and humectants, plus warming agents and is part of the Aloe Body Toning Kit. Beautifies body while toning and firming. This specially prepared cream, designed to beautify and firm the body, includes ingredients chosen to provide a rich warming and invigorating feeling. Our secret is in combining aloe and select European herbs with two remarkable warming agents, Cinnamon Oil and Capsicum . 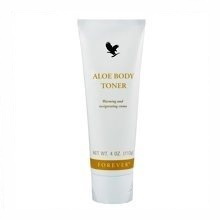 Refer to the instructions written in Using the Aloe Body Toning Kit.